After resting up at friends’ ranch in Kennewick Washington we drove into northeastern Oregon and one of our favorite places; the Wallowa Mountains. But, before we left Kennewick, we switched our cellular service from AT&T to Verizon and glad we did. Immediately our phone service improved and with Verizon’s jetpack (a small portable router) we could now access the internet using Verizon’s cellular signal even when camping far out in the back country. The Wallowas: From the ranching town of Enterprise, the Wallowa Mountains rise dramatically to snowy summits on the western side of the valley while to the east the land falls away into Hell’s Canyon, the deepest gorge in the United States. In between are remote ranches and wilderness where bears and wolves prowl. Here is the gravesite of old Chief Joseph of the Nez Perce. This is our kind of country. We arrived in the Wallow Valley on Labor Day weekend, a busy holiday time. We were tired from driving, so we moved into Wallowa State Park outside of Joseph Oregon for one night just to rest up. We knew it would be crowded and expensive, and it was. We woke up early the following morning and set off for the outback along the Hell’s Canyon Scenic Byway; a backwoods but paved route into the forested canyons. 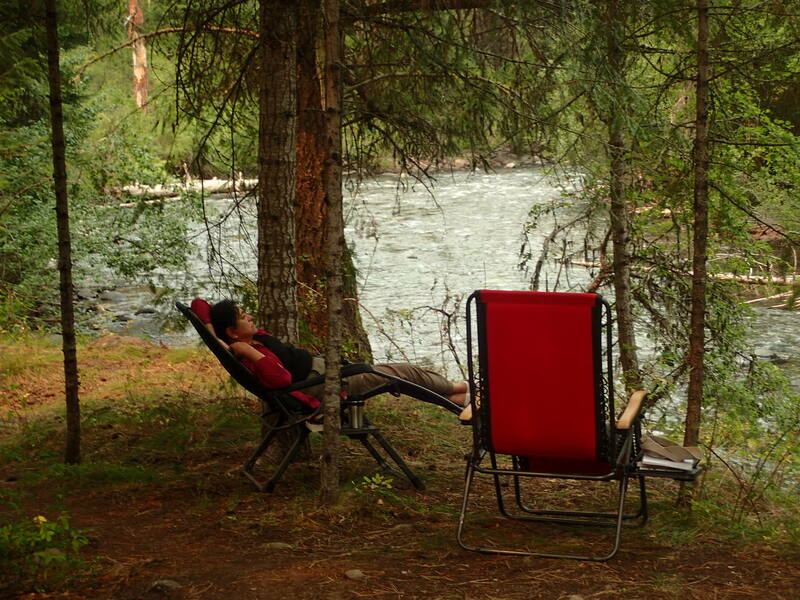 We found a primitive U. S. Forest Service camp, Blackhorse Campground, along the Imnaha River. At $8/night ($4/night for us with my senior pass) it was perfect. No services, no water, just clean vault toilets and, with our new Verizon cellular service, even internet access. The camp was almost deserted even on the busy holiday weekend. We spent the next four days hiking, driving the back roads to Hells Canyon Overlook, and relaxing while deer drifted through camp at night and bald eagles patrolled the river looking for dead salmon. Our goal from here was to spend all of September camping across Idaho and then into Wyoming, into Yellowstone and Grand Teton National Parks. The national parks are mobbed with tourists during summer, so we had planned this window to visit the Yellowstone area; after Labor Day, but before October. By October, sometimes mid-September, the first winter snows would be arriving in Yellowstone. Along the way we hoped to camp in Idaho’s remote Sawtooth Mountains, then spend a few days at Craters of the Moon National Monument. But, the forest fire smoke that had plagued us all summer was now settling into Hell’s Canyon too, and as we left our quiet camp along the Imnaha River the air became hazy then dense with forest fire smoke. This was turning out to be a record bad year for forest fires in the west and now the western states from California to Washington and eastward as far as the Dakotas were blanketed in dense, thick smoke. We drove into Hell’s Canyon, crossed the Snake River at Brownlie Dam, and entered Idaho – and the smoke got worse. We started driving towards Stanley Idaho and the Sawtooth Mountains, but the smoke was choking us. We stopped and set up our portable WiFi receiver to check the smoke reports and found that all of central Idaho was covered in thick smoke. So, we abandoned our plans for the Sawtooths and drove eastward instead trying to get as close to Yellowstone National Park as possible where the reports said the smoke was much thinner. As we drove across southern Idaho the smoke thickened and the landscape appeared apocalyptic – as if some inconceivable disaster had occurred and we were driving through its aftermath. We could taste the smoke, it burned our eyes, we started to panic. At one point, we considered turning around and making a run for the Pacific coast of Oregon or Washington State, but reports said even the coast was smoky and and raining ash in Seattle. We decided to stick with our plans for Yellowstone, but as evening fell we got too tired and finally stopped at Twin Falls Idaho, halfway across the state. The smoke was still thick, but noticeably thinner, as we pulled into a small county RV park in Twin Falls. We set up in Rock Creek RV Park, a small park within the city built inside an old rock quarry for $15/night with electricity and water. This actually worked out well for us since we could stock up on groceries, get the new tires on our truck rotated, do our laundry, dump our waste tanks, and make the final run to the Grand Tetons and Yellowstone from there. As the sun set, blood-red in the smoky atmosphere, we felt like refugees – smoke refugees. After taking care of our business in Twin Falls we set out for Wyoming. We abandoned our plans to stay at Craters of the Moon National Monument as the smoke was still too thick. Instead we drove on to the Wyoming border, stopping for a night at a U.S. Forest Service campground, Falls Campground, along the upper Snake River; a dry camp for $6/night. There are some spectacular cascades near this campground and the Snake River is beautiful here, but it was still too smoky for us and we moved on early the next morning. Our plans to wait until after the Labor Day holiday to visit this area paid off. The ranger at the local U.S. Forest Service station in Pinedale said the campgrounds at nearby Fremont Lake were almost empty now, but last weekend they were full. The air was crisp and cool with the feel of fall. We visited the Museum to the Mountain Man in Pinedale and then drove out to Fremont Lake where we found a cozy, quiet camp at the U.S. Forest Service campground there. In the early 1800s the area around Pinedale was a meeting place for the “mountain men”; trappers that lived in the mountains in the early 1800s. They would hold “rendezvous” around Pinedale; a weeks-long party of horse racing, trading, and story-telling with the Indians and fur traders – it was partying mountain man style. Typical of Forest Service campgrounds, at Fremont Lake there were no services except vault toilets and water at community spigots, but we had a strong Verizon cellular signal and a spacious, private camp with no one else in sight. The campground fee was $12/night ($6/night for us with my senior discount) and it was almost deserted. Our propane, water tanks and pantry were full, so we were self-sufficient. As evening settled in, the light forest fire smoke that had covered the lake lifted and, for the first time in weeks, we saw blue skies above us. For once, the sunset wasn’t blood-red. It shone clear and bright as we settled into our sanctuary of a camp for the next four days, glad that we had decided to continue on towards the Rocky Mountains and Yellowstone. From our camp at Fremont Lake we drove the Skyline Drive into the Wind River Mountains, hiked into the Bridger Wilderness and kayaked on the lake. Fremont Lake was great, but fall was coming fast with cold nights and cool, sunny days. So, we made the beautiful 2-hour drive from Pinedale to Jackson Wyoming and Grand Teton National Park. We were overwhelmed as we drove into Jackson – we weren’t used to so many people and traffic. We drove north of Jackson to Grand Teton National Park on a bright, sunny day and the Teton Range was spectacular though they hadn’t yet received their first winter dusting of snow. We had read about a national park campground, Gros Ventre Campground, with views of the Tetons and drove ahead for it. 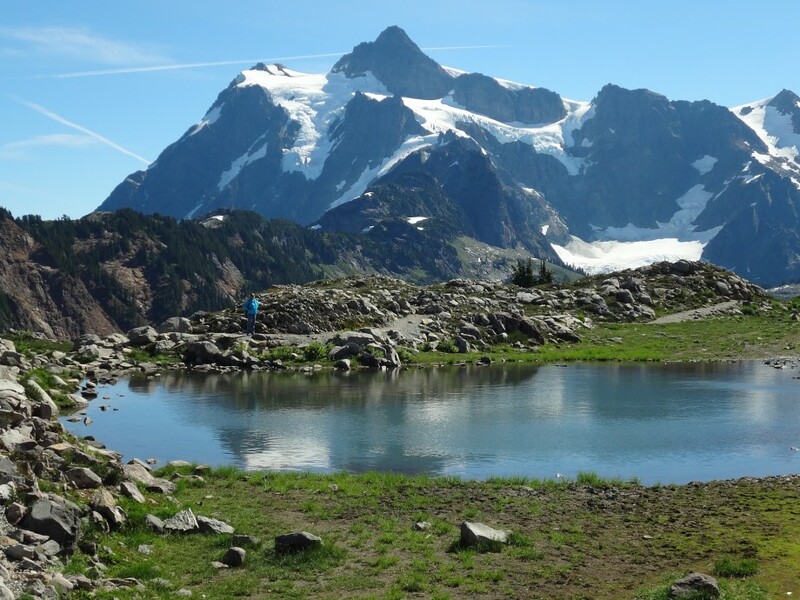 But, though set in a beautiful plateau below the mountains, it was crowded and expensive, with campsites jammed in close together and costing between $30 and $58 per night, just the kind of place we avoid. We drove further down Gros Ventre Road, past the tiny hamlet of Kelly, out of the national park and into the Bridget-Teton National Forest, then down a rough but paved road. Here we found a small U.S. Forest Service campground, Atherton Lake, for $15/night ($7.50 for us with my senior discount). No services except clean vault toilets and water at community spigots, but set on a beautiful small lake below red rock bluffs and on the edge of the Gros Ventre Wilderness Area; just the kind of place we like. We immediately moved into a private, cozy site set in a grove of aspen trees turning gold in the crisp fall air. From our comfortable camp at Atherton Lake we drove into Grand Teton National Park and hiked to Phelps Lake and the mouth of Death Canyon. We rode the tram at Teton Village to Rendezvous Mountain overlooking the Jackson Hole Valley. Later, I hiked into the back country behind the lake and we explored deep into the Gros Ventre Valley with its river flowing through red rock canyons and the jagged Teton Range rising in the distance. It was spectacularly beautiful and this is a place we’ll return to. But the weather reports predicted rain and snow. If we were going to see Yellowstone National Park, we’d have to move on. So, reluctantly, we left Atherton Lake and drove the hour and a half north into Yellowstone National Park. The drive between Jackson Wyoming and Yellowstone National Park has to be one of the most stunning drives in the United States, or maybe the world. Our goal was to stay in one of the national park campgrounds inside Yellowstone. Entering Grand Teton National Park costs $28/car and Yellowstone Park another $30/car, but we paid nothing since my America the Beautiful senior pass got us in for free. There are nine of campgrounds in Yellowstone, it was mid-September, and it was raining. Knowing that winter comes early in Yellowstone, we thought the park wouldn’t be too crowded and we’d find a spot in one of the many campgrounds. We were wrong. As it turns out, although there are fewer tourists in September, many campgrounds close then too. So, the people that are in the park are more concentrated in fewer places. Even as steady rains and fog swept across Yellowstone Lake the roads were busy. Not mobbed, but busy. And, every campground from the southern entrance of the park all the way to the northern entrance was full. We couldn’t just pull into a forest road and camp as we could in national forests or BLM lands since camping in national parks is allowed only in designated campgrounds. So, as night time fell, we finally had to drive out of the park altogether and into Gardiner Montana where we rented one of the last available spots in a private RV park. The Rocky Mountain RV Park had full hookups, but it was crowded and expensive, $58 for us with my 10% senior discount ($70 in the summer months). The saving grace was an excellent meal at the Raven Saloon in Gardiner. The following morning we ate a quick breakfast, hooked up the trailer to the truck, and drove back into Yellowstone’s north entrance arriving at Mammoth Hot Springs by 9 a.m. hoping for a camping spot. We were in luck and moved into a campsite for $10/night (normally $20/night without my senior discount) for the next two nights. There were no services, but water at community spigots, bathrooms with flush toilets and a strong Verizon cellular signal. The rain turned to snow and the temperatures dropped into the thirties. No matter, we had a campsite and our generator provided us electricity for heat and lights. So, we spent the day walking through the incredible hot springs, one of the biggest in the world, and then drove up into the mountains spotting elk drifting through the forests. We cooked a steak and corn dinner on our outdoor kitchen as the snow frosted Everts Mountain across the canyon from us. It was a great day, but winter had arrived in Yellowstone country here in mid-September. The next morning we awoke to find three inches of snow covering our trailer. I had left the awning partially extended and it was sagging under a load of wet, heavy snow, but I managed to sweep it out before it damaged the supports. That chore done, it was time to explore Yellowstone in the snow. We spent the snowy day hiking into wildlife areas and water falls. We had our lunch in our beach chairs while watching bison grazing below us. We watched herds of elk running across the plains and stood silently, speechlessly, taking in the vast wilderness of the Yellowstone stretching away from horizon to horizon. We crossed over the snowy summit of Mount Washburn to enter the Grand Canyon of the Yellowstone. We hiked down to the observation areas from the canyon rim to see one of the most magnificent sights in the west; The Grand Canyon of the Yellowstone. Here the Yellowstone River leaps over a cliff into a thousand-foot deep gorge of yellow rock and then flows on through a canyon of colorful cliffs of red, pink, blue and yellow rock. You can hear the thunder of the falls long before you see them and if you look closely can see steam vents along the shore where hot springs and geysers steam away from the volcanic rock even here along the cold river. The snows stopped and the sun shone weakly through the clouds as returned to camp late in the afternoon. We just drove on, back into nearby Gardiner Montana for dinner at the Raven Saloon again rather than cook in camp – we were just too lazy after hiking around all day. And, what a day it was! The next morning, we packed up as elk serenaded us with their whistle-like calls from a field nearby and moved to Norris, a campground towards the western entrance of the park. Norris makes an excellent base to explore the geysers and hot pools of Yellowstone and at $20/night ($10/night for us with my senior pass) it’s a bargain. There are no services, just water at community spigots and bathrooms with flush toilets, but no cellular signal. And, Norris has its own geyser basin to explore with the famous Old Faithful geyser basin is just 30 miles away. We could camp at the quiet Norris campground and avoid the mobs of tourists we knew would be at Old Faithful with its lodges and restaurants. Nighttime temperatures dropped below freezing and this was the last week Norris campground was open for the season, yet still it was almost full. Even in late September we were lucky to get a campsite large enough for our fifth wheel trailer and truck. We set up our trailer in a comfortable, quiet site and immediately went to the Norris geyser basin just a mile away from our camp. It was amazing with its clouds of steam drifting away below the snow-covered mountains and perpetual geysers and steam vents roaring constantly away filling the air with the smell of sulfur. Norris Geyser Basin isn’t as large as the Old Faithful basin, but it’s much more active. The next morning, we drove to Old Faithful geyser basin and it was mobbed, worse than we had feared. We were grateful for our quiet camp at Norris as we ate lunch in the massive Old Faithful Inn, the largest log building in the world, and walked over to Old Faithful Geyser to watch it erupt into a fountain of steaming hot water a hundred feet tall. The crowds were overwhelming so we decided to leave exploration of the rest of the basin for the next day and slowly drove back towards our quiet camp through the Firehole River Lake drive. Here there are geysers in perpetual eruption; boiling water jumping out of the ground and filling a lake with steaming hot water and staining the rock in brilliant greens, yellows and reds. As a bonus, we saw a wolf slinking through the forest near the lake as we left. We finished the day by driving through Firehole Canyon where the river has cut a gorge through the volcanic rock. We were finding that Yellowstone is full of surprises and we had seen two icons of the park in one short afternoon; Old Faithful geyser and a wolf. We settled into our comfortable trailer, ate a spaghetti dinner and watched a movie and, then it snowed again. We woke to four inches of wet snow in the morning and a forecast for Yellowstone’s first winter storm front. It was September 19th and winter had arrived. We drove back to Old Faithful Geyser Basin through the snow in four-wheel drive and walked the slippery boardwalks to the Grand Prismatic Spring, one of Yellowstone’s iconic sights. But, the cold, humid air condensed so much steam from the hot pools that we couldn’t see the them at all. Disappointed we drove out through Geyser Flats and hiked across the snowy trails for a couple hours seeing some smaller springs and geysers and more bison of course. Incredibly, even in the snow, the roads were mobbed with tour busses and tourists. By early afternoon the snow increased, so we drove back to our camp at Norris, now almost deserted, and spent the rest of the afternoon eating hot soup and warming up in our trailer. As evening fell I took a hike along a snow-covered stream and back to the Porcelain Geyser Basin. The steaming fumaroles and hot springs were haunting in the snow. But, with more snow forecast for the next four days, it looked like we might have to save the rest of Yellowstone for another time. We woke in the morning to more snow and to reports that all of the roads in Yellowstone were closed except the west entrance at Old Faithful and the south entrance, the way we had come in from Jackson Wyoming days ago, but even that was subject to closure at any time. Even the Wyoming state highway to Cody outside of Yellowstone was closed, so going there was out of the question. If we stayed we risked being snowed in for days, even a week. So, we decided to return to Jackson Wyoming while we still could. We’ll be back to the Tetons and Yellowstone. There’s nowhere else like it and everyone should see it at least once. Now we were heading south as fast as we could. We drove out of Yellowstone and stopped for a night at the Gros Ventre campground outside of Jackson Wyoming, the campground we had passed up earlier, but from here we could stock up our pantry and fuel the truck. We chose a dry site, no electricity or water for $14.50/night with my 50% senior discount. I refused pay any more to stay at this crowded campground even though sites with electricity were available for double the cost. We woke to a couple inches of wet snow, but the highways were clear so we hitched up early and drove on to Pinedale Wyoming where we had camped a couple weeks ago. We moved into the same campsite on Fremont Lake that we had stayed at ten days earlier, site #16, except now the whole campground was almost deserted and it was free to camp there since the Forest Service had turned off the water for the season. From here we decided to drive on into Utah and camp at Dinosaur National Monument in the far northeastern corner of Utah. From there we could easily make it to Moab in southern Utah where temperatures were in the 70s and 80s and the red rock canyonlands of Arches and Canyonlands National Parks are nearby. Besides, we had a rendezvous arranged with our friends John and Lorie who were traveling through Moab in their motorhome. So, as thunderstorms rumbled over our camp on Fremont Lake Wyoming we prepared to leave the Rocky Mountains vowing we would be back in the spring to visit all the places we had missed. But we had no regrets. It’s all beautiful.